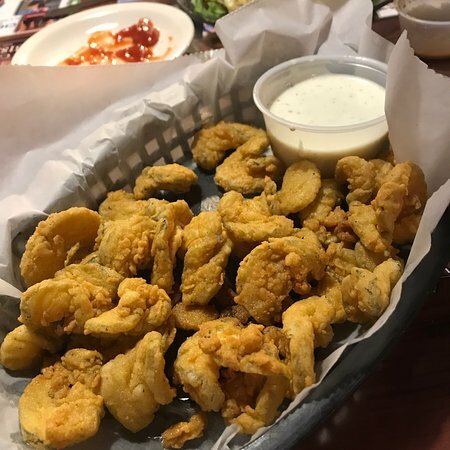 Hand battered dill slices fried to a golden brown served w/ ranch dressing. Our own blend of Mexican cheeses, tomato & cilantro served hot w/ tortilla chips. Filled w/ black beans, corn, chicken & cheese, fried & served w/ avocado ranch dressing. Bottomless bowl of our own recipe served w/ tortilla chips. Eight slightly battered bone-in wings. Mozzarella cheese, fried golden brown & served w/ ranch dressing. Homemade fries‏ covered w/ melted cheese, chives & bacon bits served w/ ranch dressing. 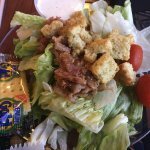 Crisp romaine lettuce, tomatoes, croutons & parmesan cheese mixed w/ caesar dressing & topped w/ mesquite grilled chicken. Shredded lettuce, cheese, tomato, eggs, bacon & green onions, topped w/ smoked ham & turkey breast served w/ your choice of dressing on the side. 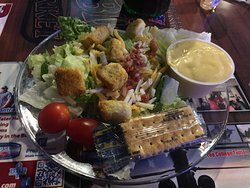 Shredded lettuce, cheese, tomatoes, bacon & green onions topped w/ grilled chicken breast or fajita skirt steak served w/ your choice of dressing. Shredded lettuce, cheese, chives, bacon bits tomatoes & your choice of dressing. Shredded lettuce,‏ cheese, tomatoes & green onions topped w/ seasoned taco meat served on a crisp tortilla shell. Crispy fried chicken on shredded lettuce, tomatoes, bacon, cheese, green onions & your choice of dressing. With butter, bacon, chives, sour cream & cheddar cheese. Sampler platter‏ of mesquite grilled steak, shrimp & chicken breast served w/ grilled veggies. Choice dry-aged angus beef grilled to order. Choice dry-aged beef grilled to order. Marinated, seasoned & mesquite grilled to order. Marinated & mesquite grilled to order. Two semi-boneless quail roasted over a mesquite fire & grilled to perfection. Tender skirt‏ steak butterflied, seasoned & mesquite grilled. Marinated, seasoned, mesquite grilled & covered w/ BBQ sauce. Two fajita enchiladas (beef or chicken) & two tamales served w/ refried beans & rice. Mesquite grilled chicken or beef rolled in flour tortillas, smothered w/ your choice of ranchero, sour cream, chili, or queso sauce served w/ refried beans & rice. Flour tortillas filled w/ cheese & grilled onions, smothered w/ your choice of ranchero, sour cream, chili, or queso sauce served w/ refried beans & rice. Four tamales stuffed w/ shredded pork, covered w/ our meaty chili & cheese & served w/ refried beans & rice. 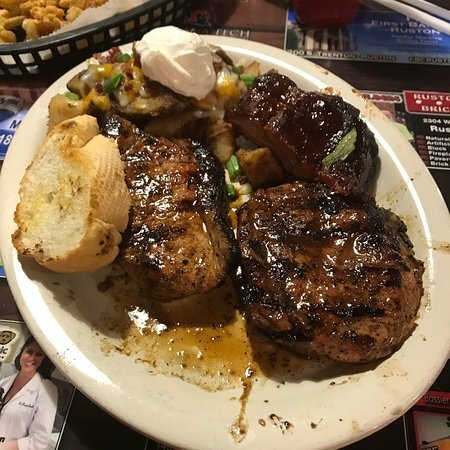 Marinated chicken, skirt steak or shrimp served on a sizzling platter w/ flour triple tortillas, grilled onions & bell peppers, served w/ chips & salsa, sour cream, guacamole, pico de gallo & cheese. Served w/ refried beans & rice. 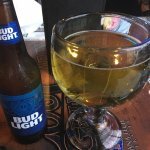 Your choice of large tortilla filled w/ mesquite grilled chicken or beef, salsa, beans, & cheese smothered w/ your choice of sauce served w/ refried beans & rice. Your choice of tortilla filled w/ grilled chicken or beef & cheeses, fried to a golden brown & covered w/ your choice of sauce served w/ refried beans & rice. Crisp tortilla‏ w/ fajita beef or chicken w/ beans & cheeses on a tortilla served w/ sour cream & pico de gallo. Fajita grilled chicken or beef w/ grilled onions, bell peppers & swiss cheese on toasted french bread. 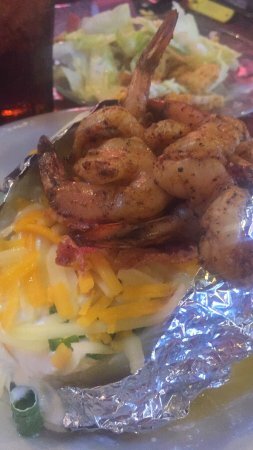 Jumbo shrimp grilled w/ BBQ sauce, onions, bell peppers & swiss cheese served on toasted french bread. Jumbo fried shrimp w/ lettuce, tomato & pickles served on toasted french bread. Mesquite smoked sliced brisket w/ onions, bell peppers, swiss cheese & au jus sauce served on toasted french bread. 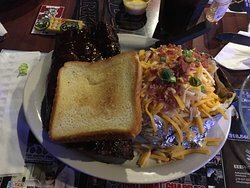 Your choice of smoked turkey, ham, brisket, sausage or pork piled high on toasted french bread served w/ BBQ sauce on the side. Savory BBQ meat on texas toast served w/ BBQ sauce on the side. Nathan’s thick & juicy hot dog served open faced & covered w/ chili & cheese. The classic bacon, lettuce & tomato on toasted texas toast. Lettuce, tomato, pickle, cheddar cheese, grilled onions & bell peppers. Sauteed mushrooms, melted swiss cheese, lettuce, tomato, pickles, grilled onions & bell peppers. Guacamole, lettuce, tomato, cheddar cheese, pickles, grilled onions & bell peppers. Grilled onions & bell peppers smothered w/ brown gravy. Melted cheddar cheese, grilled onions & bell peppers & covered w/ our meaty chili. Pepper jack cheese, jalapeno peppers, hot sauce, lettuce, tomato, pickles, grilled onions & bell peppers. Tenderized chicken breast grilled or fried topped w/ pepper jack cheese, bacon, lettuce, tomato, & pickle. Tenderized breaded steak or chicken deep fried, served w/ cream gravy w/ your choice of side & dinner salad. Choose two smoked meats: turkey, sliced brisket, ham, sausage or pork. Served w/ two sides. 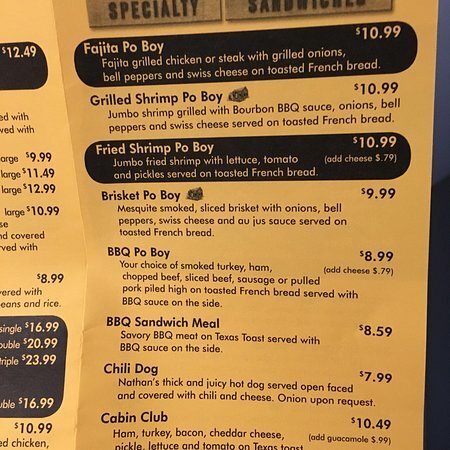 (Baked potato or cajun roasted potatoes count as both sides). 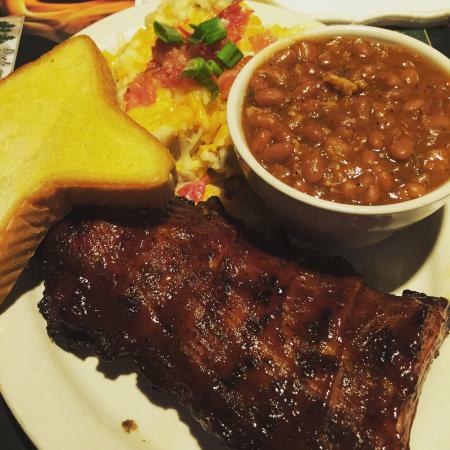 Smoked chicken smothered in BBQ sauce served w/ your choice of one side & a dinner salad. Deep fried breaded chicken strips served w/ your choice of one side. Loaded w/‏ sauteed mushrooms, onions, bell peppers, pepper jack cheese & brown gravy w/ one side & a side salad. Hand-battered jumbo shrimp fried to a golden brown served w/ side & side salad. Two fried jumbo lump crab cakes served w/ our remoulade sauce. Vanilla ice cream in a frozen bowl covered in coke, dr. pepper or barq’s root beer. 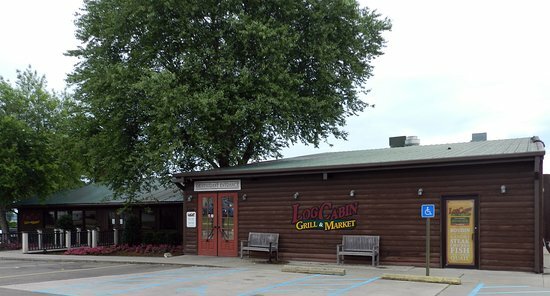 Log Cabin è il mio ristorante preferito in Ruston, La - Il mio preferito è il pollo e verdure alla griglia sono necessarie! Pollo migliore che abbia mai fatto! 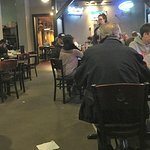 Vale la pena il viaggio da West Monroe! Buon servizio, buon cibo, e i prezzi erano buoni! 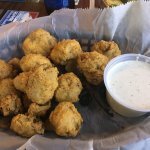 Uno dei nostri punti di andare a Ruston è di mangiare al Log Cabin. Con una vasta scelta di cibo c'è qualcosa per tutti! ! Il cibo è buono e le porzioni buone. Il servizio e il cibo è davvero ottimo. Tutto ottimo posto per mangiare. Era molto contento di questo posto. Lo consiglierei a chiunque e famiglie, sono benvenuti. Ricevi risposte dal personale della struttura Log Cabin Grill & Market e dai visitatori precedenti.